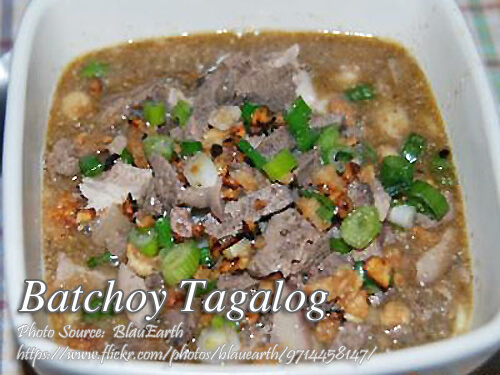 Batchoy is a well known Filipino soup and it originates in Ilo-ilo. This version, the batchoy tagalog is one of the variants and this recipe has a unique and authentic flavor because the meat is smoked before cooking, don’t have noodles and with the addition of pork blood. I think this recipe will be a great addition to your menu specially on birthdays or other occasions. Smoke pork for at least one hour. Cut smoked pork and liver into strips. Set aside. In a wok, saute garlic, onion and ginger at the same time. Stir fry for a few minutes until the onion is cooked and turns brown. Add the pork and liver and stir fry for a few minutes until broth comes out of the meat. Pour the fresh pork blood and season with fish sauce. Mix for a while until all the ingredients are covered with pork blood. Cover the wok and cook until all the liquid evaporates. Then transfer all the meat contents of the wok to a big heavy pot that can hold about 5 liters of liquid. Pour 4 liters of water in the pot and cover. Simmer for at least 30 minutes or until the meat is tender. Then add the green chilies and chili leaves and turn off the fire immediately. The heat of the dish will cook the chili and the leaves so it will look presentable and not overcooked. This is a great batchoy recipe I found! Quite savory because of the smoked meat. Hi Gary, the extra effort of smoking the meat is rewarding.